Origin Eastern United States (Alabama, Arkansas, Delaware, District of Columbia, Florida)except New England. It is also known from Ontario. Euonymus americanus of the Celastraceae (Bittersweet family) commonly known as Strawberry Bush, American Strawberry Bush, Brook Euonymus is a species of flowering plant native to wooded slopes, moist understory forest areas, low sandy woods, ravines and stream banks from New York south to Florida and west through Pennsylvania to Illinois, Missouri, Oklahoma and eastern Texas. Range in Missouri is limited to the far southeastern corner of the State including Crowleys Ridge and the Bootheel. 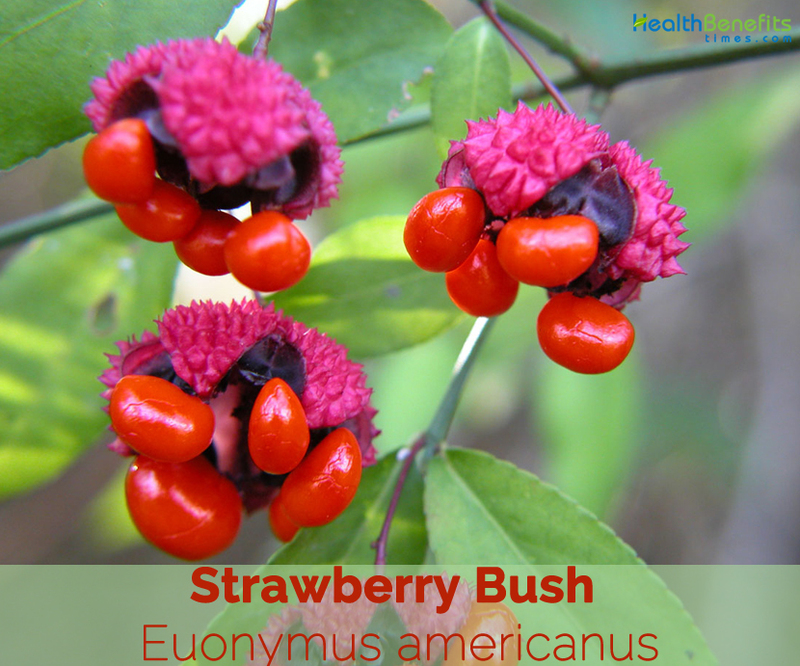 Few of the popular common names of the plant are Bursting Heart, Hearts-a-Burstin, strawberry bush, hearts-bustin’-with-love, Wahoo, fish wood, burning bush, hearts-a-burstin-love, running strawberry bush and fish wood. 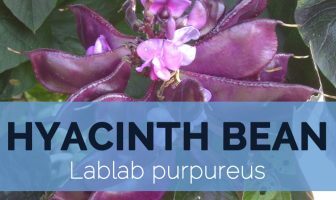 Genus name is an ancient Greek name referring to plants of this genus. Specific epithet means native to America. Some spell the specific epithet “americana” instead of “americanus” used here. 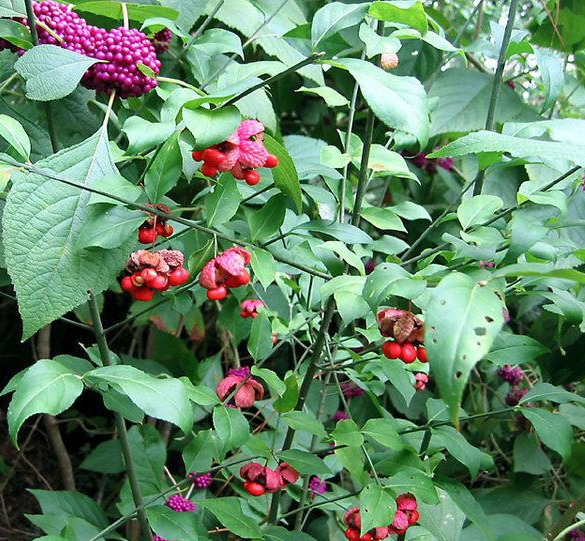 This is because botanists disagree as to whether the genus name Euonymus should be treated as feminine or masculine. In classical Greek, the generic name was treated as feminine; however, Linnaeus treated the genus as masculine. 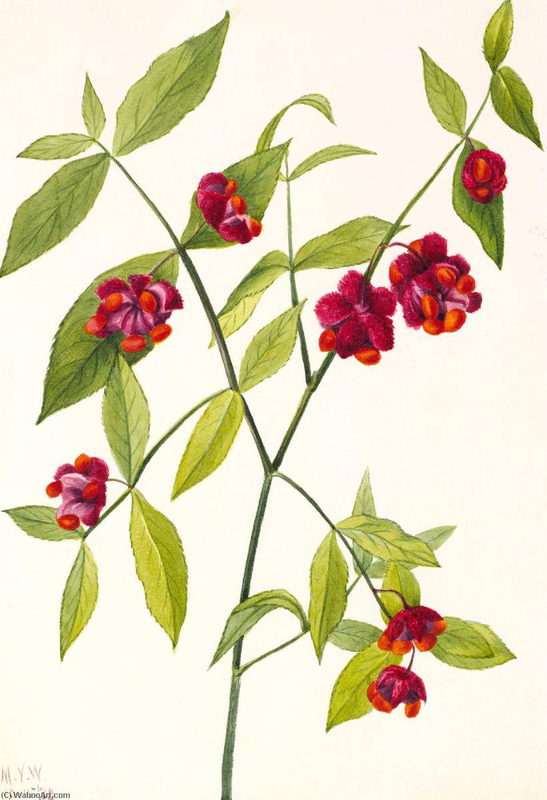 The spelling “Euonymus” has formally been conserved over Linnaeus’s originally spelling “Evonymus,” which has also occasionally been used. 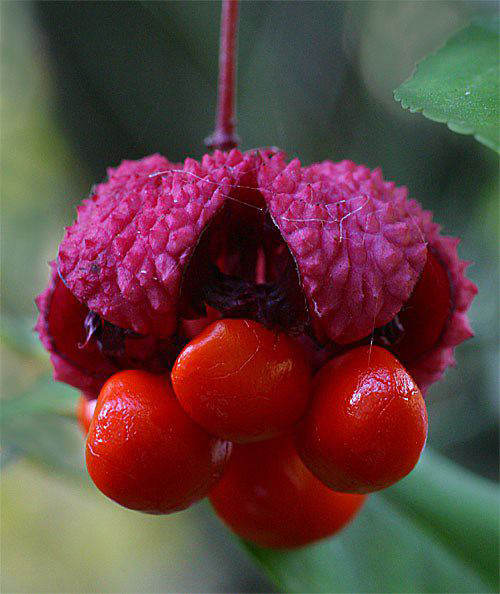 Strawberry Bush is a low growing, delicate, airy deciduous shrub that grows about 6 feet tall by 3 to 4 feet wide. 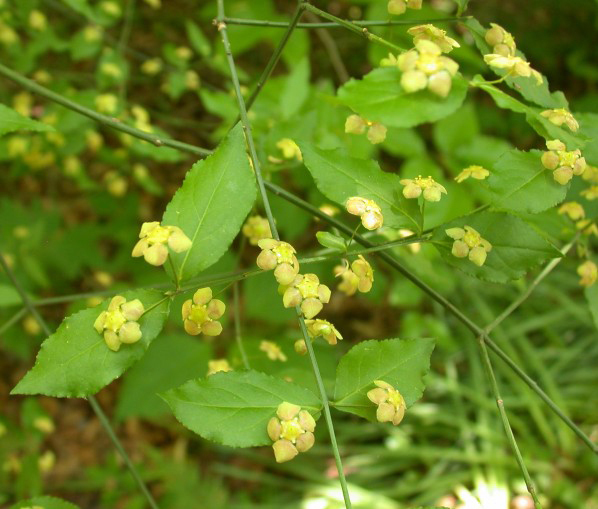 The plant is found growing in deciduous woods, sandy thickets, swamps, woodlands, shady edges, ravines, and stream sides, wooded slopes, moist under story forest areas, low sandy woods, ravines and stream banks. The plant prefers moist, well drained, organically humus rich, slightly acidic soil. It does well in shady situations, tolerating even full shade. 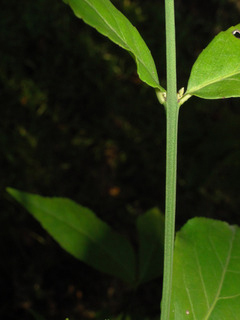 Stem is stiff, green, glabrous, straight, round, 2 to 5 mm in diameter, and are occasionally four-angled. The pith is white, round, and continuous. Bark is green, but does split and become darker. Twigs are slender, square and green, terminal buds are reddish orange, 1/4 inch long and pointed. The leaves of the strawberry bush are opposite (two per node), spaced somewhat evenly along stem. The petioles are short, less than 3 mm and sometimes are nearly absent, the leaves then appearing sessile or sub-sessile. The leaf blades are slightly leathery to papery, oblong to elliptic, 4- 10 cm long and 2 – 3.5 cm wide, with cuneate or attenuate bases, crenulate margins, and acuminate apices. 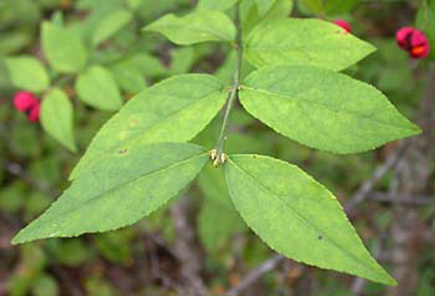 The five to seven pairs of ascending lateral leaf veins disappear before reaching the margin. Leaves turn dark orange-red in fall. The leaves are opposite and simple. 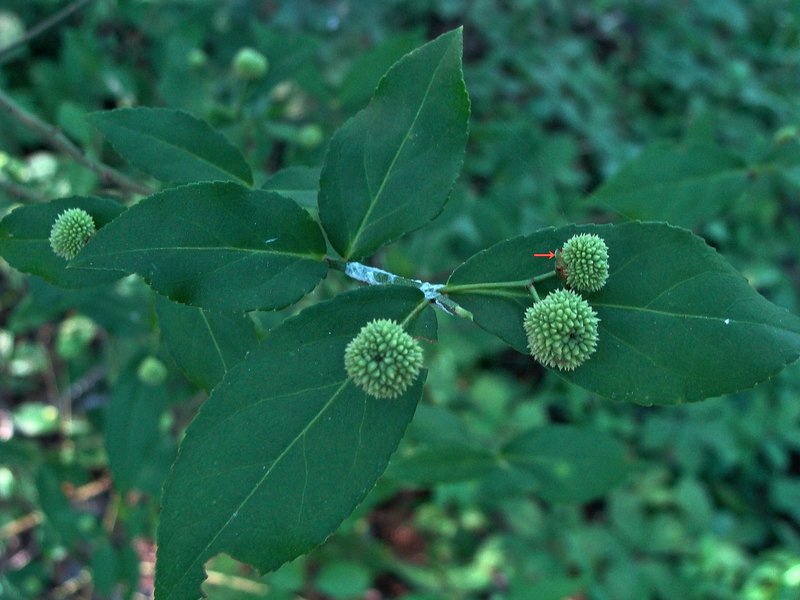 It has attractive green stems in the winter. The flowers occur on the current season’s growth in small axillary clusters (cymes), each cluster usually consisting of two peduncles, each with one to three flowers (often one or two of the flowers will aborte, leaving only one functional flower per peduncle). The peduncles are slender, 1.5 to 2.2 cm long. When there is more than one flower per peduncle each flower is subtended by a short pedicel, 1 to 3.5 mm long. The flowers are bisexual, about 10 mm in diameter, with the sepals and petals readily distinguishable from one another. Calyx comprises five yellow to green sepals, 1-1.5 mm long and 1.6 – 1.8 mm wide. The corolla comprises of five greenish to reddish petals up to 4 mm long and 4 mm wide. There are five stamens, 1.5 – 2.0 mm long. The five carpels are fused. A sticky nectarous disk is present, 3 to 4 mm in diameter. 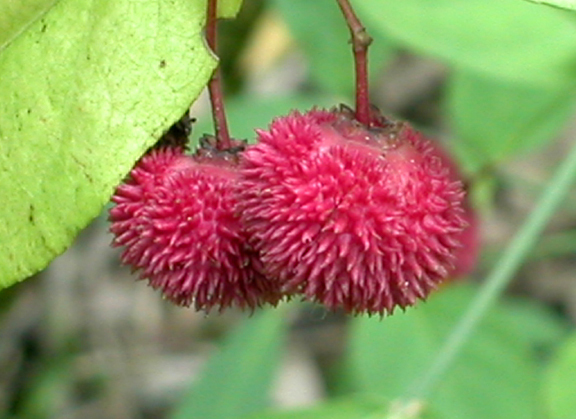 The color and shape of the fruit gives it its common names. Flowering normally takes place from March to June. Fertile flowers are followed by a plump, red globose dry, five-lobed capsule up to 1.5 cm in diameter prior to opening. The surface of the capsule is thickly covered with minute spines or warts on the surface. 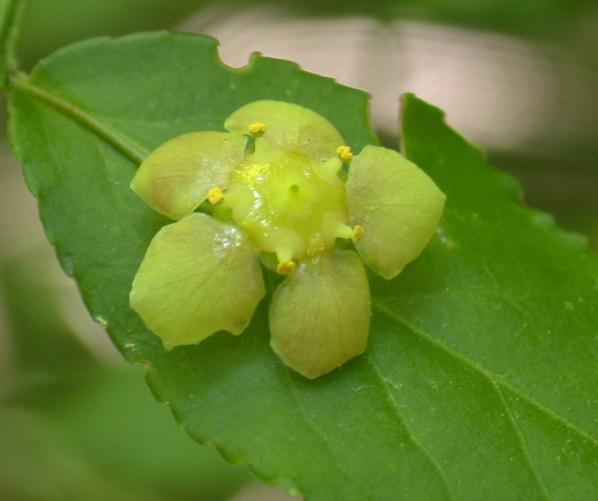 This species is the only species of Euonymus L. in North America to have a capsule with a spiny or warty surface. The capsule opens along the lobes, exposing the seeds that are covered by a fleshy, scarlet aril. The seeds (sans aril) are brown, glabrous, ellipsoid, 7- 9 mm long and 4 -5.5 mm wide. The seeds are dispersed by animals. Deer have been known to graze on this plant and seem to love the tender leaves and stems. Humans should take the red color of the seeds as a warning; they are known to be a strong laxative and cause severe diarrhea. In fact, this genus of plants in general is considered poisonous to humans. Tea made from the roots is used in cases of uterine prolapse, vomiting of blood, painful urination and stomach aches. Bark is diuretic, expectorant, laxative and tonic. It was used as a tea in the treatment of malaria, liver congestion, constipation etc. Powdered bark, applied to the scalp, was believed to eliminate dandruff. An infusion of the plant has been used to stimulate menstruation and so should not be used by pregnant women. 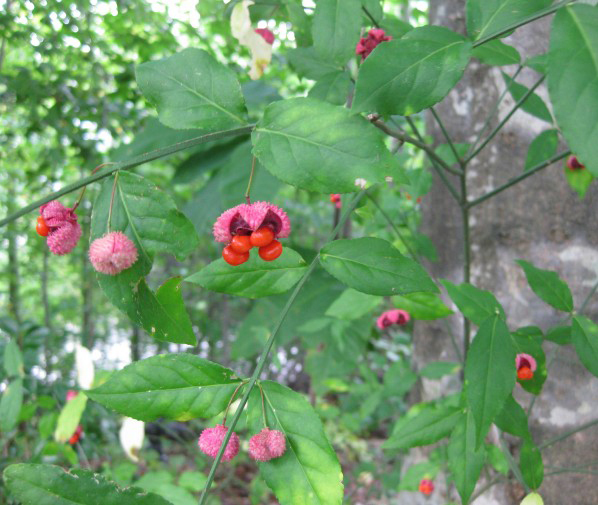 Native Americans used the roots of Strawberry-bush to make a tea for stomach and urinary problems and uterine prolapse. 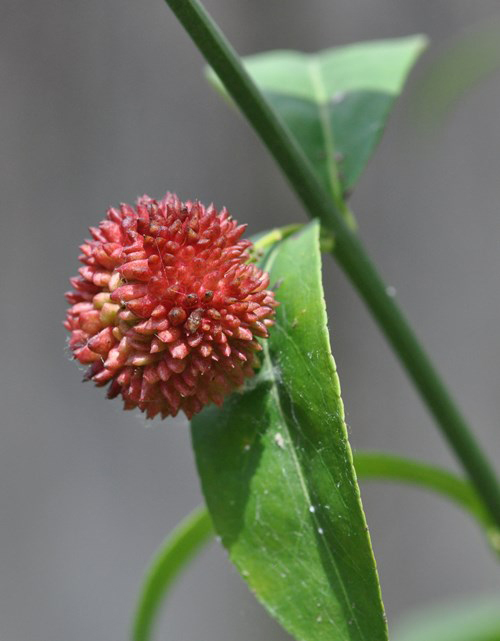 Strawberry bush is an excellent ornamental species. The leaves turn dark red in autumn. Leaves and twigs are considered to be deadly poisonous to domestic sheep and cattle. Fruits, seed and bark are considered to be poisonous. Fruit seeds and bark are poisonous. Avoid ingesting without any medical supervision. 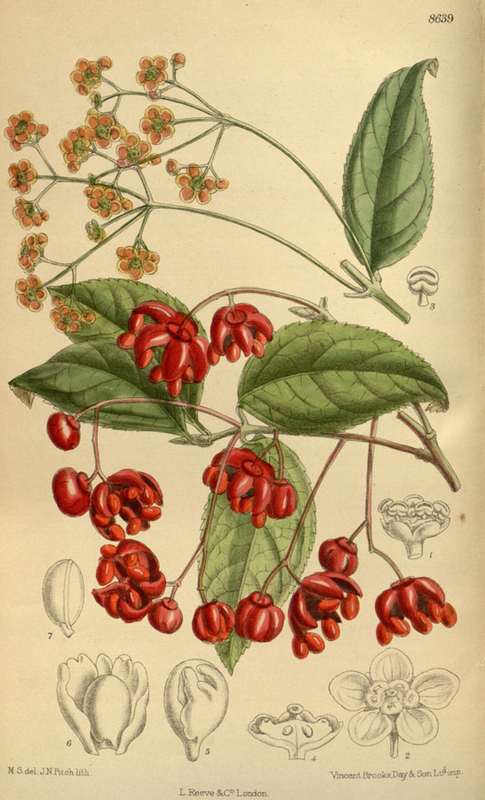 Many authorities report that the fruit and bark of the Strawberry-bush and its relatives contain glycosides that cause severe diarrhea in humans.